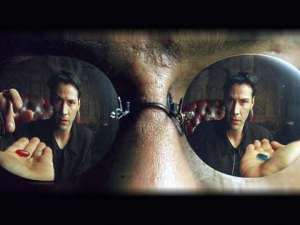 When the movie blockbuster,The Matrix, was first released over a decade ago, it created quite a stir, not only because of it’s cutting-edge special effects and graphic novel sophistication, but because it was a provocative blending of mythology, eastern mysticism, Christian themes, philosophy, science fiction, and a fist full of kung fu. Blending the hero’s journey with the messiah story, it can be viewed as both religious and atheistic, intellectual and exploitative, profoundly thought-provoking and shallow fun. And at the heart of the story lies the ultimate question: What is the truth about the nature of life? It is one of the fundamental questions. And in a word where truth, like beauty, is considered to be a relative thing, it is ironic that the heart of man still searches for some semblance of what is genuinely, objectively, and ultimately True.